How to put a new sheen on a 3 decades old Steel Contractor with custom web design. 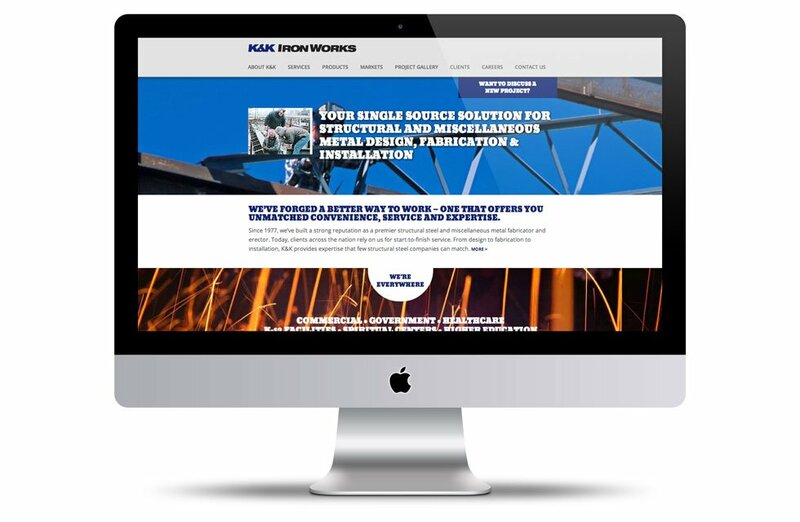 In the Spring of 2014 K&K Ironworks commissioned Vortex Communications to design and build a new website for their steel contracting firm. The challenge was to create a smartphone-friendly site that used a minimal amount of content to make a strong impression of K&K capabilities for web visitors. K&K Ironworks, a family-owned structural steel contractor based in Chicago was founded in 1977 on the principles of quality and integrity. They are the only Chicago-based company AISC-certified in both fabrication and erection. They deliver a full scope of services from design, detailing, fabrication and erection. Their project ranges from miscellaneous metals projects such as stairs, railings and canopies to multi-story structural steel work for residential and commercial building structures, transportation and renovation. K&K works directly with end users as well as operating as a sub-contractor on larger projects. To give a sense that the web visitor was looking through a window at a real project underway, Vortex Communications used large photos of structural steel work presented within a parallax viewing scheme. Commenting on the interface design solution, Weinkle says, “Parallax scrolling is not unique, but we’ve used it in a way that enhances the message rather than just trying to “wow” visitors. To add to the overall effect, we chose “Bevan”, a google font for headlines and the “Open Sans” family for text elements. The final result is a design with visual details that relate to structural design, as well as contemporary web design. The website was custom built (no templates) by Vortex using WordPress. The Miami-based graphic + website design firm made it easy for the client to manage content changes through a customized editing interface. One of the client’s priorities was to be able to add examples of work to the online project gallery, and so Vortex adapted WordPress’ “posts” approach instead of “portfolio” to help with basic SEO activities. “The K&K project did not come with a huge budget, but that didn’t preclude us from building a well-designed website that stands out. In order to tweak the site for organic search engine optimization, Vortex customized page titles, meta descriptions and image alt tags appropriate to K&Ks industry and popular search terms for the launch. Vortex also set up analytics so the client can measure their progress over time.